Look at the picture above. On December 20th, 2015, I enrolled in three communities with the Google+ page of one of my clients. Then I posted two articles in these communities, taking care to interact somewhat with their members. From January 4th to 10th, 2016, my client’s site received 13 visits from Google+, against nine from Pinterest and three from Facebook. communities on Google+ gastronomy, the number circled in green indicate the posts published since my last visit yesterday! The new Google strategy is based mainly on Google+ collections and communities, introduced in December 2015. I will not write here about the collections, wanting to illustrate the reasons why I cherish the communities. 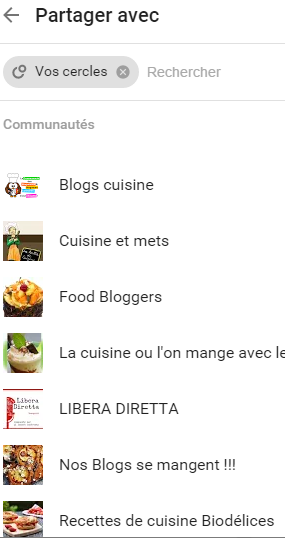 Pretty simple: once connected to your Google+ account, click left on communities, and insert the desired word in the top search field (for example, “cooking” if you are looking for culinary and gastronomic communities). Then ask to join communities of interest, without exaggeration, as the posts of the communities of which you are member will be displayed on your home page. It is better to have few but well chosen ones, so as not to be overwhelmed with posts that have little interest for you. If you want to publish something, in a predisposed field on your home page, when you click, there is a small circle to the right of your name. If you click it, a popup menu appears with the words “Your circles”, “public”, and the names of communities where you have already published. If it’s the first time you publish, click down on “details” and you will get he list of communities to which you belong. See figure on the right. This is a social network, be nice, do to others what you would have them do to you. Avoid self-promotion at any will. If something pleases you, give it a + or comment. Try posting interesting things that bring value to other members of the community and to users who will read you. If your business, for example, invented a great additive for car fuel, which can help consume and pollute less, publish an article showing the damage of car exhaust pollution on public health, and average spending for fuel, article in which you add a link to your revolutionary product. Your posts will not go unnoticed. Look here left: the business I had in my last 24 hours after publication in three gastronomic communities. Come join the fun communities of “plusers”!